I have this thing about wanting to make use of every single bit of artistic material possible. When I finished my daughter's big girl quilt, I was left with eco-friendly batting remnants and plenty of marvelous fabric. 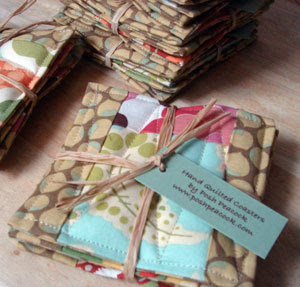 I made a fleet of quilted coasters for a holiday craft fair and as Christmas gifts this year for some family and friends, and I love how they turned out and also made use of every last bit.